Fast-food giant McDonald’s rolled out hamburgers made with fresh beef this week at more than 700 restaurants throughout Southern California. 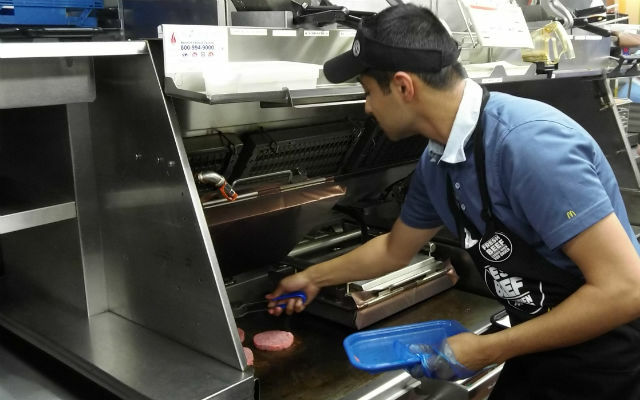 The company is offering fresh — not frozen — beef that is cooked to order with its iconic Quarter Pounder sandwiches and Signature Crafted Recipe burgers. McDonald’s fresh beef strategy has been in the works for three years. It required the installation of new refrigerators next to grills to ensure the proper storage temperature. The Chicago-based company said the switch to fresh beef is part of a broader commitment to bring customers better food options without sacrificing speed and convenience. “We are proud to bring our customers a hotter and juicier quarter-pound burger at the speed and convenience they expect from us,” said McDonald’s USA President Chris Kempczinski.